I enjoy hard science fiction and the technical dialog that goes along with it. I’ve taken classes in physics and always struggled — probably because as a science major the classes I had to choose from were too technical, and the concepts of quantum mechanics and advanced mathematics were always a bit much for my brain to comprehend. I did absorb a little physics, and as a result, I already knew a lot of what he discussed and didn’t learn much that was new. It was, however, an enjoyable book and an interesting refresher. 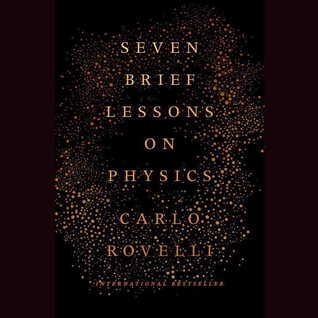 If you are interested in learning a little about physics but know nothing about it, this book is an excellent choice. In plain language the author explains difficult concepts of general relativity, quantum mechanics, elementary particles, gravity, black holes, and the complex architecture of the universe. The author performs the narration. I don’t think this was a good choice. Rovelli’s accent is so strong that it was distracting and at times difficult to understand. Narration matters. I can’t emphasize this enough. Perhaps it was meant to sound like a TED talk or speech, but I would have preferred a professional narrator. Listen to the sample to decide for yourself. You have me curious about this one but I see what you mean about the narration. Thanks for your honest review of this audio book, Leslie. I took Physics in high school but I mostly remember basic concepts and formulas. I’ve never taken physics and doubt I could grasp much of it. This probably isn’t for me.